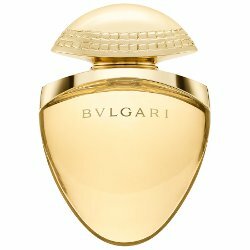 Goldea is the latest pillar from Bvlgari. Its "jeweled bottle", according the the brand, "incarnates the gold and the sun", and it was also inspired by the "powerful symbol" of Serpenti.1 The juice, developed by perfumer Alberto Morillas, is described as "a bright, golden musk symphony". I was cheered by the news that it was geared towards older women, that is, 30+, which is about as "older" as the fragrance industry is usually willing to go, but perhaps a little dismayed by the name — Goldea? Now taking votes, does anyone like that name? — and the commercial with Isabeli Fontana, which looks like something Guerlain might have done in the 1980s, and is very nearly as corny as the name. Anyway, the idea of a "golden musk symphony" is reasonably well represented by the floriental fragrance, so long as you like your golden musk symphonies a bit on the sweetish side (the notes: crystal musk, orange blossom, bergamot, raspberry, golden musk, ylang ylang, jasmine, velvet musk, amber accord, patchouli and papyrus). You can tell pretty quickly that it's not geared towards teenagers: the raspberry did annoy me for a few minutes early on, but Goldea is not heavily fruity, and the floral notes are weightier than the average. So are the musk notes, which while hardly what you'd call animalic, do speak in loud tones, pretty much from the opening straight through to the end. The overall effect is of a warm, golden floral musky amber, with a light dusting of sweetish powder at the finish. On some wearings it struck me as far too sweet for my liking, but on other wearings I hardly noticed, smelling instead interesting little touches of hay-like notes, the slightly briny aspect of the amber (or the musk? ), and a bit of greenery here and there. The lasting power is very good. Verdict: Goldea is well done, but for someone else, not me. I do not generally mind heavier fragrances, and Goldea in any case is hardly even a contender for heaviest floriental — it's too modern for that. But something about the level of the particular musks used here did not work well for me, and even on the days that the sweetness did not bother me, a kind of general claustrophobia settled in after an hour or so. Every time I wore it, it made me happy to shower it off, and I did not risk an evening wearing lest it get on my bedding, since we all know that Perfumista Law #22 declares that any fragrance you don't love is sure to have the half life of plutonium, and be impossible to remove via ordinary means (like the wash cycle). Bvlgari is hoping, of course, for another Omnia, a pillar to spawn a thousand flankers.2 Given how little the juice of Omnia informed its flankers, perhaps all that matters is that consumers respond to Goldea's packaging? And I'm sure some people love the bottle, but personally I'd rather have the 25 ml "jewel" flacon, shown below, that Bvlgari already had in their stable. Do comment if you loved it! Bvlgari Goldea is available in 25, 50 and 90 ml Eau de Parfum. It is widely available but not as of yet in the US, where it is expected to launch soon. 1. All quotes in first paragraph are via the Bvlgari website. 2. I have totally forgotten where I read that Omnia made up a third of Bvlgari's fragrance business, and I have no way of knowing if it's true. But it wouldn't surprise me. Interesting! Gonna have to give it a sniff, for the old brain bank. Ok, offhand I can’t think of anything better either, if gold has to be in the name and we can’t use French. But I did think Omnia was a great name! Both of the bottles are gorgeous, and I agree there is something throwback about the ad copy, but still “luxurious”. I’m no fan of big musks, but the rest of your comments are intriguing. Part of your description makes me think of something like Chantilly or Sublime or L’Interdit which is a “mature” powdery amber oriental with *strawberry* notes….. This smells way more modern than any of those. There may well be tons of “real” flower notes in Goldea, I wouldn’t know, but there is something about the heavy synthetic musks that makes the whole thing smell like it was made in a lab, even if this one doesn’t smell like what I’d call “cheap”. Doesn’t smell “luxurious” either though, or at least, not my idea of luxury. Smells like what it is, really: a mid-priced modern mainstream prestige fragrance. It will ages before it gets to A-NZ, but although I would love to find a new love that is easy to obtain (that is, that does not require a mule or overseas postage), nothing about this sings a siren song to me. The name is vaguely annoying–I suppose it should be pronounced “Gol-day-ah” to suggest the golden goddess thing, but equally, it could be pronounced (and probably often will be) as “Goldie”. I just don’t know: it may be lovely in person, but in the abstract, it feels off, and not a triumph for anyone, including the marketing department. Yes, it’s supposed to get the “golden goddess” pronunciation. I have no idea how Goldea will do, but I hate nearly everything about the presentation, even the Serpenti jewelry. I must really be an Omnia person all around, since I usually love the jewelry they put in the Omnia fragrance ads. I was going to say that the one part of the whole boiling that I somewhat like is the bracelet. I’ve liked the idea of a snake bracelet since my older sister’s boyfriend presented her with something similar. She was 18, and to my 8 year old self, it seemed like the dizzy heights of sophistication– I daresay that if I saw it in real life, with the benefit of another 55 years of life, I would think it overstated and slightly tacky. I love it for the 25ml option alone! I am very tempted by the 25 ml Omnia Paraiba…they really are just adorable. I need to investigate whether or not those sizes ever end up at the discounters. Probably not! I saw the white, sunshiny one –is it called Aqua Vita?– at Strawberrynet not so long ago. Ah, good to know, thanks. Maybe that’s the Aqua Divina. I have seen the 25 ml version of Coral and Indian Garnet at Nordstrom Rack. Lovely, thanks. Will keep an eye out for the Paraiba then. Thanks for the review, Robin. I know you are annoyed by some of the modern musks. Does this smell at all like the SSS musk base, which is something I really like, do you have any idea? You are very spot on with the ads seeming kind of throwback. The picture at the top is as if they are featuring that bracelet more than anything else. Honestly I don’t know…this is a cocktail of musks, and I’m not good enough to notice which aromachemicals are which. I usually can pick up iso e super or ambrox, but to be honest I don’t pay a lot of attention, and I couldn’t tell you what Laurie uses either. Oh, and on the throwback ad, honestly, when she started to climb the steps of the pyramid I started to laugh. Versace & Paco Rabanne do those kinds of ads as tongue-in-cheek and I was hoping this one would turn out that way too, but no, they appear to be serious. Honestly I might just prefer writhing. That ad is very, very, very reminiscent of the Lancôme Miracle ad with Uma Thurman. No pyramid, no jewellery, but the basic structure is the same. Those look less dated than this one too! I don’t like the jewelry either, and generally I’m a sucker for stuff with snake motifs. The bracelet just seems clunky I guess. That said, this sounds at least worth a sniff (though I have no idea what “crystal musk” is supposed to be). As for the Omnias, I love the original (I’m wearing it today), but aside from Crystalline I haven’t cared for the flankers (don’t remember Coral much, though). But I haven’t tried Paraiba, and after reading your review of it, I kinda want to. Guerlain ads from the 80s – yes! Samsara, Nahema and maybe Shalimar. As for gold, Dior does gold way better than this. Exactly, but Guerlain did it better, and it just looks so dated in the Bvlgari ad. Dior — you mean they do better gold jewelry? Sorry, yes, was thinking of J’Adore. Of course Dior probably has a bigger advertising budget than Bvlgari. Ah, I am slow, I thought we were talking about jewelry or fragrance rather than the ads. Thanks! (apparently koura is the Maori word for gold–I looked up gold in a bunch of languages). Both of those are way better! This one is so on the nose. Oh, especially love Koura! I had looked up golden goddess in Italian, which is apparently something like Oro Dea, so I can see why they didn’t go with that. A “musk symphony” must be something of like a “tuba symphony,” but probably even less interesting. I’ve been waiting for this review! I love Omnia and Black so much, and like The Vert and Blv Notte, so I’m always hoping for something great from Bulgari, but from your description this will not appeal to me. Ah well. 100% with you on the name. Oh do give it a shot, I’ve seen very positive reports elsewhere. Ah, but you are the reporter I most often agree with Anyway, I’m sure I’ll get to sniff it in a department store. Well, and from your list it sounds like we have similar taste. But you never know! This sounds very much like it would resemble Dolce & Gabbana The One. Anywhere in the ballpark? I am sorry to tell you that at this point I have no memory of The One at all. I looked at my review of The One Desire, which I do vaguely remember, and I see that I also mentioned the half life of plutonium in that review as well, but they aren’t really much alike — I’d call that one a fruity gourmand, and Goldea, although I don’t much care for it, is both more sophisticated and better done. At last! A fragrance description that evoked more than a yawn or irritated sigh. I love the musk spectrum from powdery vanilla cuddly to “Who lit a cow pasture on fire?”, so am definitely interested in this one. Not to mention I love loud and heavy perfumes (they’re such a rarity it seems these days) so can’t wait to spray some on the perfume quicksand that is my skin. Thanks for giving me a release to actually be interested in, Robin! Will be interested to hear what you think of it! Will this end up being a Bergdorf’s/Nordstrom/Barneys line for Hermes or do you think it will ever end up at Sephora? I won’t likely get a sample very easily from the latter three, but samples from Sephora are fairly easy to get. Not sure what you mean by “for Hermes” but I think the Bvlgari will be at Sephora. Sorry. Had Hermes on my mind rather than Bulgari while writing this reply. lol Needed some coffee before typing. The Omnia bit makes sense given how many flankers there are, though why the original got discontinued if it is so successful is still baffling. I hope this one works for me as I haven’t liked anything from the line since Jasmine Noir. I may need to get a perfumista demerit because…I went to the Bvlgari Boutique (on 5th and 57th across from Bergdorf) and went straight to the Serpenti jewelry collection. I couldn’t even tell you if perfumes are sold there! It must have been a slow shopping day because the impeccably turned-out SA was very attentive despite me being in my $50 Costco special down puffy coat (super-warm by the way and so worth it) and my $8 genuine faux Burberry scarf. Umm, ok, maybe he was attentive BECAUSE I was dressed as such and clearly did not belong there. Aaanywaay, back to Serpenti – GORGEOUS! I asked to see THE snake bracelet and he asked if I wanted to see the LEATHER version. Nope, and I pointed to the diamond-encrusted offerings under the glass case. To his credit, he did not bat an eyelash and unlocked the case and asked if I wanted to try any of them. Oh be still my heart! I mentally oohed and ahhed and demurely asked to try the ring. Verdict, it was a little too fat all around but the quality of it was superb — every segment of the snake seemed to have been individually crafted and linked so smoothly that it coiled and fit my finger perfectly. I saw, but did not try a few other pieces around the store. I finally showed him the Serpenti bracelet and asked how much it was. nozknoz low-balled it @ $70,000. Wait for it, wait for it…. 280, LOL! I think you get extra perfumista points. Hajusuuri, you mean you didn’t walk out with one for every day of the week just because? *snorts* What an awesome piece, though, even if the sticker shock is practically laughable. hmm.. the ad looks very 90s. the fragrance doesn’t sound like my thing, although i’ve liked most of the bvlgari scents i have tried. Again replying while sleepy is dangerous. Was thinking about Hermes instead of Bulgari (too much pricy pretty cluttering my brain today.) but I do love some of their jewelry, as does my older daughter when we were looking at some for fun online. I told her not to get any ideas. I was magpie attracted to their skin care line when it first launched, but didn’t dare try it for fear of actually liking a product at those prices. I wonder if it’s still out there and if anyone’s still buying it? I didn’t even know they had a skincare line! LOVE the bottle. Love the name too! Gold-Dee-A. That’s how I pronounce it. I want to smell this immediately! I think it might be love! P. S. It does come across somewhat Guerlain-ish in the advertising, kind of like the ads for Samsara or Mahora. So sad, South Africa got this, but not the blue (or black) tea. I too found this ‘claustrophobic’ or somehow oppressive. Maybe the blue tea will get there eventually? I have not seen the black tea here either. Yeah, not sure – none of the teas are available at mainstream stores, but I do see the original and Rouge at the odd boutique. Seems Goldea is the big launch/possible pillar and all. I’m STILL waiting to see Eau de Cartier Vetiver… We did get the Rose and Soleil versions so not sure why that never arrived.